Faculty were recognized for excellence in teaching during the Faculty and Staff Recognition celebration. Front row (left to right): Brian Brodeur, Chancellor Kathy Cruz-Uribe, Margaret Thomas Evans, Executive Vice Chancellor of Academic Affairs Michelle Malott, Deborah Miller and David Kim. Back Row (left to right): Gloria Dixon, Shelly Burns, Josh Tolbert, Jay Barbre, Julien Simon, Wazir Mohamed, Beth Trammell and Terri Hardy. Dixon received her Doctorate of Nursing Practice from IUPUI. She received her Master of Science in Nursing Administration from Indiana Wesleyan University and her Associate of Science in Nursing and Bachelor of Science in Nursing degrees from IU East. She teaches didactic and clinical nursing courses. Her scholarly interest is in Scholarly interest is the implementation of a Dedicated Education Unit (DEU) for clinical rotation. Shelly Burns, clinical assistant professor, received the Lecturer or Clinical Instructor Excellence in Teaching Award. This award recognizes excellence in teaching by a lecturer or clinical faculty member. Burns received her Doctorate of Nursing Practice from IUPUI. She received her Master of Science in Nursing from Ball State University, her Bachelor of Science in Nursing from IU East, and her Associate of Science in Nursing from Kettering College of Medical Arts. She teachers first-year nursing students in classroom and clinical courses. Her scholarly interest is in integrating digital clinical experience into the classroom. Katie Miller Wolf, assistant professor of anthropology, received the Horizon Teaching Award. This award recognizes excellence in teaching by an untenured faculty member during some or all of their first four years at IU East. Miller Wolf received her Doctorate in Anthroplogy and her Master of Arts in Anthropology from Arizona State University. She received her Bachelor of Arts in Anthropology from Indiana University. She teaches a variety of traditional and online courses including anthropology, forensic anthropology, human origins and prehistory, bioarcheology, culture and society, and others. Her research intersts include Bioarchaeology, odontometry, dental morphology, kinship, social organization, kinship, identity, physical anthropology, human osteology, biogeochemistry, archaeology, Mesoamerica, North Africa, prehistoric, historic, and colonial periods. Josh Tolbert, assistant professor of education, received the Horizon Service Award. This award recognizes excellence in service by an untenured faculty member during some or all of their first four years at IU East. Tolbert received his Doctorate of Education in Special Education/Educational Psychology and his Mater of Arts in Liberal Studies from the University of Michigan-Dearborn. He received his Bachelor of Arts in Art Education and Spanish from Western Michigan University. He teaches courses in classroom assessment, educating students with learning disorders, special education methods, learning disabilities and mild disabilities, human diversity and others. His research interest is in the use of visual strategies in instruction for students with learning disabilities, acquisition of foreign language vocabulary by students with learning disabilities, disciplinary equity involving urban students with special education needs. Margaret Thomas Evans, chair of the English department and assistant professor of English, received the Excellence in Service Award. This award recognizes excellence in service — campus, community or professional, either one-time or sustained (five years or more), by a full-time faculty member above and beyond the standard expectations of any compensation or release time provided for the service. Thomas Evans received her Doctorate in English from Miami University. She received her Master of Arts in English from Wright State University and her Bachelor of Arts in Independent Studies from the University of Lancaster. She teaches courses in composition, professional writing, digital writing, technical writing and literature. Her research interests include leadership, managing online distance education programs, online teaching practices, and women, rhetoric and technology. Tim Scales, senior lecturer of management and director of the Center for Entrepreneurship, received the Distinguished Service Award. This award recognizes distinguished and sustained (10 years or more) service — campus, community or professional, by a full-time faculty member above and beyond the standard expectations of any compensation or release time provided for the service. Scales received his Master of Business Administration from Anderson University. He received a Master of Science in Banking from the Graduate School of Banking at the University of Wisconsin at Madison and his Bachelor of Science in Business and Associate of Science in Business from IU East. He teaches courses in entrepreneurship, economics, finance and investment. He works with students as an advisor for Delta Mu Delta, ENACTUS, and developed the BOSS program. Wazir Mohamed, associate professor of sociology, received the Faculty Special Achievement Award. This award recognizes outstanding all-around achievement, either short-term or sustained, by an IU East faculty member, and can be awarded for any combination of teaching, research and service. Nicole Mann and David Bane received outstanding support staff member and professional staff member awards. Mohamed received his Doctorate in Sociology and his Master of Arts in Sociology from Binghamton University. He received his Bachelor of Science in Communication from the University of Guyana.His research interests are on the intersections of Atlantic slavery, particularly the rise of slavery in the age of abolition, the second slavery in Cuba, Brazil, and the U.S.A. with the persistence of ethnic divisions and marginalization of the descendants of slaves in the African Diaspora of the Caribbean and the Americas. Beth Trammell, associate professor of psychology, received the Community Engagement Award. This award recognizes excellent community engagement by a faculty or staff member. Trammell received her Doctorate in Psychology and her Master of Arts in Counseling Psychology from Ball State University. She also received her Bachelor of Science in Architecture from Ball State. She is a licensed psychologist at Still Waters Professional Counseling, LLC, in Muncie. She teaches courses in behavior disorders and adolescence, psychology, counseling and lifespan development. Her research interests include parent training, diagnosis and treatment of childhood behavior disorders, and effective teaching strategies that impact student and faculty expectations. She developed the Purposeful Parenting program, providing free parenting training for the community. Brian Brodeur, assistant professor of English, received the Horizon Research Award. This award recognizes excellence in research and/or creative work by an untenured faculty member during some or all of their first four years at IU East. Brodeur received his Ph.D. in English Literature and Creative Writing from the University of Cincinnati. He received his M.F.A. in Creative Writing from George Mason University and his B.A. in English and a Minor in History from Salem State University. He teaches courses in American literature, literary theory, creative writing, poetry and poetics. His research interests include forms and genres of poetry, lyric theory, digital humanities, and literary citizenship. Broduer also established a Veterans Writing Program for the community. Jay Barbre, interim vice chancellor for Academic Affairs and associate professor of education, received this year’s Award for Excellence in Research. This award recognizes excellence in research and/or creative work by a full-time faculty member over a sustained period of time. Barbre received his Doctor of Philosophy in Education, his Master of Science in Curriculum and Instruction, and his Bachelor of Science in Elementary Education from Oklahoma State University. He teaches education courses, with an interest in poverty in education and foundations in education. His research interests include comparative education; nationalism and the manner in which it influences education and communication; transition from secondary schooling to post-secondary schooling; qualitative research applications within educational and other contexts; the use of film to enhance the context and experience of reflection; documentary film making within the public school context. Julien Simon, associate professor of World Languages and Cultures and coordinator for Study Abroad, received the Distinguished Research Award. This award recognizes distinguished research and/or creative work by a full-time faculty member over a sustained period of time (10 years or more). Simon received his Doctorate in Spanish and his Master of Arts in Spanish from Purdue University. He received his Master of Science in Materials Science Engineering from University of Grenoble. He teaches courses in Spanish, French, and literature. His research interests include cognitive literary studies, Early Modern Spanish literature, Hispanic studies, literary genres, film studies. Deborah Miller, assistant professor of psychology, received the Progress Award for New Faculty. This award is given to faculty to acknowledge their contributions to teaching, research and service. Miller received her Doctorate in Counseling Psychology, her Master of Arts in Counseling and her Bachelor of Science in Creative Writing from Ball State University. She is a licensed psychologist with a private practice in Muncie. She teaches courses in psychology, history of psychology in Europe, multicultural counseling, cooperative work experience, and others. Her research interests include masculinity, LGBT issues, fatherhood and clinical judgment. Tanya Perkins, assistant professor of English, received the Teacher Scholar Award. This award recognizes faculty work with undergraduate research and/or creative activity. Perkins received her Master of Fine Arts in fiction from Murray State University, and a Master of Arts and Bachelor of Arts in English Studies, both with an emphasis in creative writing, from Western Washington University in Bellingham, Washington. She teaches courses in fiction, professional and technical writing, digital writing, creative writing studies. Her research interests include short story cycle, contemporary fiction, digital media, online teaching and learning, program assessment. She established the Community Creative Writing Workshop for the community. Terri Hardy, adjunct instructor of sociology, received the Part Time Faculty Award. This award recognizes excellence in teaching by a part-time faculty member. Hardy received her Master of Arts in Sociology from Ball State University. She received her Bachelor of Science in Behavioral and Social Sciences from IU East. She teaches courses in sociology, sociology of families, and social problems. IU East also recognized four faculty members who are grant recipients for research projects and course development. Andrea Quenette, assistant professor of communication studies, received the Erwin and Priscilla Boschmann Scholarship of Teaching and Learning Grant. The grant is possible through the generous contribution of Erwin and Priscilla Boschmann. This award is offered annually to full-time faculty to support research in the Scholarship of Teaching and Learning (SoTL) at IU East. Quenette received her Ph.D. from Ohio State University. She teaches and researches in the area of political communication and the effects of news content on the public. She also studies the communicative process of teaching and learning and is interested in using alternative types of grading to facilitate the educational experience for students and instructors. Her project, “Grading as a Communicative Act,” is designed to examine the underlying attitudes and emotions that underlie or are related to how faculty and instructors evaluate student work. David Kim, lecturer of criminology, received the Center for Faculty Development Faculty Fellowship for 2019. Each year, the Center for Faculty Development offers one faculty fellowship in the Scholarship of Teaching and Learning (SoTL), providing faculty members with an opportunity to cultivate and share their knowledge, techniques, and information on a particular teaching topic. Kim received his bachelor’s and master’s degrees in Criminal Justice at Washington State University. His research interests are policing and innovative teaching pedagogy. His project, “Interactive online discussions: Let us change the way we talk!,” is designed to examine and reframe the way instructors perform interactions in the online classroom. Evans and Miller received the Chancellor’s Community Engagement Course Development Grant. This grant promotes the intersection of community engagement and pedagogy, the chancellor’s office has designated course development funds to support faculty interested in incorporating community engagement activities into their courses. Thomas Evans’ project, “Community Grant Writing,” allows students to form partnerships in their own communities by assisting local organizations with grant writing. Miller’s project, “Supervised Research and Student Learning,” combines research and service learning in a highly mentored experience. Psychology students will collaborate with mental health facilities to address real life, critical issues. 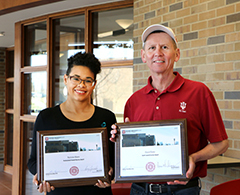 Awards were presented to an outstanding support staff member and professional staff member who have made significant contributions to IU East during the past year. Recipients of the Professional Council Service Award and the Staff Council Service Award are nominated by their peers. David Bane, mailroom specialist for the Office of Physical Facilities, received the Support Staff Council Service Award. The recipient of the IU East Staff Council Service Award is selected based on his/her attitude, commitment, teamwork, contribution, and inspiration to the mission, goals and strategic initiatives of IU East. Bane was nominated for his willingness to help with projects, providing support to campus and new employees, crosstraining co-workers, positive attitude and for his work ethic. Nichole Mann, coordinator of advising and nursing student services for the School of Nursing and Health Sciences, received the Professional Council Service Award. 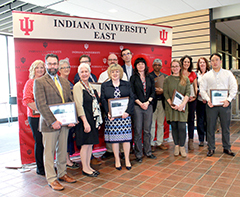 Professional Council Service Award recipients will have made a significant impact on IU East, as demonstrated through the areas of exemplary achievement and performance, excellence in customer service/personal interaction, outstanding education support/initiative and creativity. Mann was nominated for her positivity and enthusiasm, respectful treatment of others, advocate for students and her can-do attitude.